Drainage & dehumidification. Our complete crawl space waterproofing system includes a sump pump, a heavy-duty dehumidifier like the SaniDry™ unit shown here, and a perimeter drainage system as shown below. If you have water leaking into your crawl space, it's important to find a solution as soon as possible. Seepage through crawl space walls and the crawl space floor is a problem in many homes. Left untreated, a wet crawl space can easily be damaged by mold, termites, and wood rot. Fortunately, wet crawl space problems can be eliminated by installing an effective crawl space waterproofing system. The waterproofing experts at Dry Pro Foundation and Crawlspace Specialists can install a waterproofing system that addresses all your needs. We make it easy to repair your wet crawl space with state-of-the-art products and techniques, and we provide free estimates on crawl space repair services. As Greater Charlotte's trusted waterproofing contractor, we serve Concord, Charlotte, Gastonia and the surrounding area. The best time to install a crawl space waterproofing system is when the crawl space is being sealed or encapsulated. The air and vapor barriers used in the encapsulation process prevent moist exterior air from entering the crawl space and condensing on cool crawl space surfaces. A waterproofing system will capture water that seeps through crawl space walls and floor areas, transporting this water to a sump pump for automatic ejection to the exterior. Invisible and effective. 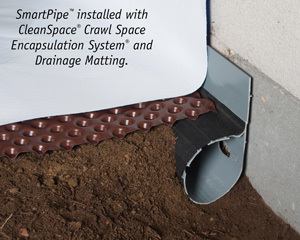 SmartPipe™ perimeter drains and dimpled Drainage Matting are covered by a durable CleanSpace® moisture barrier. To promote good drainage along the crawl space floor, we recommend installing our innovative drainage matting. This dimpled plastic sheet is especially important to use in a dirt-floored crawl space. The patented SmartPipe™ drainage system is designed for installation against crawl space walls. Thanks to its unique profile and integral filter fabric protection, SmartPipe™ will never clog or fail to capture wall and floor seepage. This perimeter drainage system is connected to a crawl space sump pump that automatically pumps collected water outside your house. 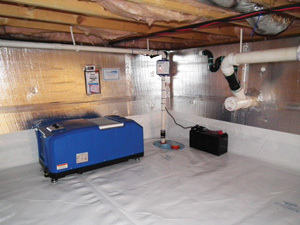 For best protection, install a Basement Systems sump pump system with battery backup. This protection ensures that your waterproofing system will keep working even when the power goes out. The final ingredient in a complete crawl space waterproofing system is a crawl space dehumidifier. A crawl space dehumidifier isn’t required in all cases, but one may be necessary for a large crawl space or a crawl space that has been wet for a long time. An ENERGY STAR® dehumidifier is designed to easily handle the low temperatures and harsh crawl space conditions that can overwhelm standard “appliance store” models. Interested in our crawl space waterproofing or crawl space repair services? Contact Dry Pro Foundation and Crawlspace Specialists today for a free estimate, offered to customers in Charlotte, Concord, Gastonia, Huntersville, Rock Hill, Hickory, Kannapolis, Mooresville, Monroe, Indian Trail and nearby North Carolina. Give us a call at 1-844-201-7501 or contact us online.